And that is the end of the live page today. Some timings for you. We will be live again on Sunday at 17:30 GMT, before the race starts at 19:00 GMT. It is all set up perfectly with Ferrari's Sebastian Vettel in pole position, alongside Max Verstappen of Red Bull on the front row, while Lewis Hamilton starts in third, next to team-mate Valtteri Bottas. Thanks as always for all your comments and we will see you all again tomorrow for what is going to be a thrilling race. Who will win the Mexican Grand Prix? Can Lewis Hamilton seal a fourth drivers' championship on a track loved by Ferrari? 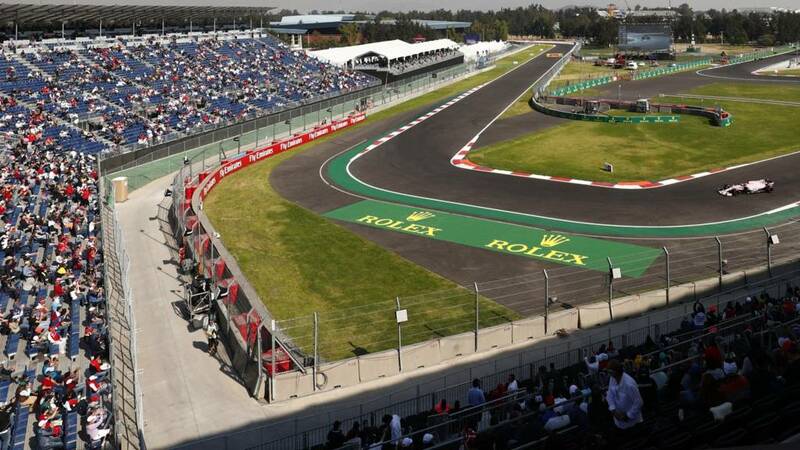 Predict your top three for the Mexican Grand Prix. Ferrari's Sebastian Vettel stole pole position for the Mexican Grand Prix from Red Bull's Max Verstappen as Lewis Hamilton lines up third. He pipped the Dutchman by 0.086secs, saying on the radio "what a lap". Hamilton, who needs only to finish fifth in Sunday's race to be sure of the title, was 0.446secs off pole. Max Verstappen is asked about the stewards looking at whether he blocked Valtteri Bottas. "I was on the inside. He was on his line and he looked up so there was no incident." He adds to Sky Sports: "There is no incident for me. That's his own problem if he out-breaks himself in the next corner. I didn't hold him up so he can say what he wants. I moved to the inside." Max Verstappen is down-playing the incident with Valtteri Bottas in Q3, which the stewards are currently investigating. Bottas said Verstappen impeded him and 'ruined his lap'. There are some happy people in the Force India team at the moment, with Esteban Ocon sixth and Sergio Perez 10th. Red Bull's Daniel Ricciardo after qualifying seventh: "Every time I left the pits I had no grip. Sometimes you get one set of tyres that you can't turn on but every run was the same story. "Super frustrated and confused. I'm sure we'll find something, but it doesn't make the session any easier to go through. "If we get the car back I think we can get to a podium. I was for sure angry but I'd say helpless." It is a half century for Sebastian Vettel. Mercedes boss Toto Wolff on Sky Sports: "It was pretty close between the three teams, closer than we expected. "We knew it would be a difficult circuit for us. I'm actually quite satisfied. We’ve taken a step closer to Red Bull and Ferrari and that is satisfying." And here is Mercedes' Valtteri Bottas, speaking to Sky Sports, about that incident with Max Verstappen in Q3. The stewards will decide if the Red Bull driver blocked the Finn. "I was on my lap and I could see in the last sector he was going quite slow at the exit of turn 12 and compromised my line a bit for turn 13," said Bottas. "It's not up to me if it is worth a penalty - I don’t know what the rulebook says. All I know is it ruined my lap." Great, late drama in Mexico City. This is how the top 10 finished qualifying three. Remember, we are waiting to here if there is to be any action taking against Max Verstappen with the stewards looking at an incident involving the Dutchman and Valtteri Bottas in Q3. Mercedes' Lewis Hamilton on Sky Sports after qualifying third: "Those guys (Vettel and Verstappen) did a great job. I gave it everything in the last lap. "I could've been a couple of tenths of a second quicker but it wouldn't be enough to match these guys. We're still in for the win - I hope to have a battle with at least one of them." Mike Greenwood: Going to be an interesting first corner. Jeremiah Kariuki‏: Indeed, the race tomorrow will be an absolute cracker. Mercedes and Red Bulls seemed to have good race simulation. Hamilton will be hoping that Vettel and Verstappen go for each other, and in the process, he takes the lead! Andrew Ogley‏: Wow ... this is shaping up to be something spectacular tomorrow. Andy White: Verstappen and Vettel crash out first corner, Hamilton then on an extended title procession. Red Bull's Max Verstappen on Sky Sports after qualifying second: "I'm super annoyed. "In Q3 it got a bit more difficult - I couldn't get the tyres to work. Second is good but not the way it went. I really wanted that pole position." What a qualifying session from Esteban Ocon. He is sixth, ahead of Red Bull's Daniel Ricciardo in seventh. Home favourite Sergio Perez will start in 10th position, with the Renaults of Nico Hulkenberg and Carlos Sainz in eighth and ninth respectively. Ferrari's pole-sitter Sebastian Vettel on Sky Sports: "I'm really happy. It's difficult and slippy and difficult to get everything in one lap. "I had a moment in turn six, I nearly lost it there. But I knew if i could keep it clean in the last sector it would be enough. "Yesterday wasn't that good for us but we improved overnight. I'm really happy but the race pace should be good." Craig: Tomorrow looks set to be a good one. Vettel will be desperate to keep his title hopes alive. Could he snap under pressure? Amit Mandalia: Vettel & Verstappen on the front row. I think Seb will handle it differently than the last time in Singapore. Mercedes wouldn't have expected the performance of Red Bull here - the Ferraris yes. The faces of Mercedes bosses Niki Lauda and Toto Wolff - it was sort of shock. "Yes, it's pole position. Yes." The German does exactly what he needed to do. He snatches pole position out of the hands of Max Verstappen. Vettel needs to win and hope Lewis Hamilton does not finish in the top five to keep the world title race alive. Hamilton is third, on an all-Mercedes second row. Vettel jumps to first with a new track record of 1:16.488. Talk about doing it in style. Great drama.